Background: Quinoxaline is versatile ring systems which possesses a wide range of physicochemical and biological activities. This heterocyclic nucleus is becoming an attractive target for extensive research due to its inherent diverse properties. Various efficient, mild and eco-friendly methods have been developed for the preparation of quinoxaline derivatives in high yields. Here, we have highlighted some convenient methods for quinoxaline synthesis along with their novel biological properties. Methods: Various novel, mild, eco-friendly and efficient methods have been developed for the preparation of quinoxaline derivatives in high yields. Recent development in synthesizing quinoxaline derivatives includes the application of principles of green chemistry as it is pollutant free and environmental friendly. 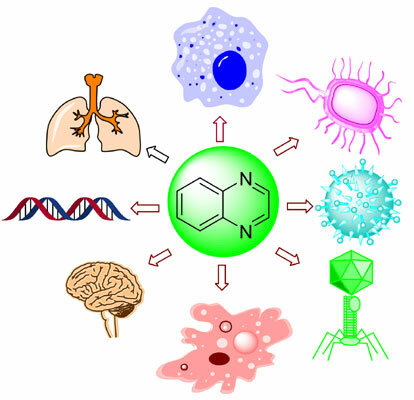 The present review highlights some convenient methods of synthesis based on both organic and green approach and also its wide varieties of biological activities which would be very much promising in the field of medicinal chemistry. Results: More than eighty papers have been included in the manuscript. The clear synthesis and biological profiles have been highlighted in this manuscript. I believe all these results must be useful for the current development in quinoxaline chemistry. Conclusion: Quinoxaline derivatives have been emerging as important chemical moieties for last twenty years. Recent development in synthesizing quinoxaline derivatives includes the application in principles of green chemistry as it is pollutant free and environmental friendly. Here, in this review, we described the pathways which were based on both conventional and green approach. The literature survey also reveals that quinoxaline and its derivatives show a wide variety of biological activities such as anticancer, antiviral, antimicrobial, anticonvulsant and antichagasic, which would be very much promising in the field of medicinal chemistry. Keywords: Quinoxaline synthesis, anticancer, antichagasic, anticonvulsant, antidepressant, antiprotozoal. Keywords:Quinoxaline synthesis, anticancer, antichagasic, anticonvulsant, antidepressant, antiprotozoal. Abstract:Background: Quinoxaline is versatile ring systems which possesses a wide range of physicochemical and biological activities. This heterocyclic nucleus is becoming an attractive target for extensive research due to its inherent diverse properties. Various efficient, mild and eco-friendly methods have been developed for the preparation of quinoxaline derivatives in high yields. Here, we have highlighted some convenient methods for quinoxaline synthesis along with their novel biological properties.